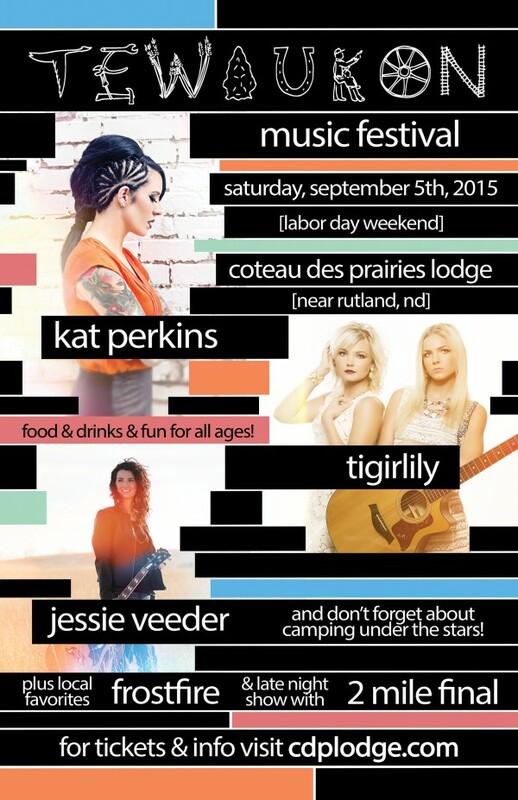 Coteau des Prairies Lodge is hosting an exciting outdoor music festival Saturday, September 5th, 2015 (Labor Day Weekend). Tewaukon Music Festival is fun for all ages! Enjoy live music from the hottest regional artists plus camping under the stars, great food and drinks and family entertainment including inflatable games, pony rides, face painting and more at one of the most unique concert venues in the upper midwest! Kat Perkins – a vocal sensation on the national scene from the small North Dakota town of Scranton. As a Top 5 contender on Season 6 of NBC’s The Voice, Kat captivated America with her powerful, rock inspired music. Tigirlily – an amazing sister duo from Hazen, North Dakota. Their catchy pop songs are perfect for adults and youth alike. Kendra and Krista are true rising stars right here in North Dakota! Jessie Veeder – a symbol of folk music from the badlands of Western North Dakota. Jessie’s sound is reminiscent of the legends of folk music but her style is fresh and relevant. 2 Mile Final – our late night closing band from Minneapolis is bringing the party. This country rock / southern rock band is hot on the regional scene and is perfect for dancing and singing outside under a starlit sky! FrostFire – playing the second stage and keeping the fun going all day will be our ultra local talent. Two brothers, one sister (who lives only two miles from the lodge) and a good friend make up FrostFire. Expect a lively show featuring your favorite rock, country and pop hits! Get discount advance tickets online now. 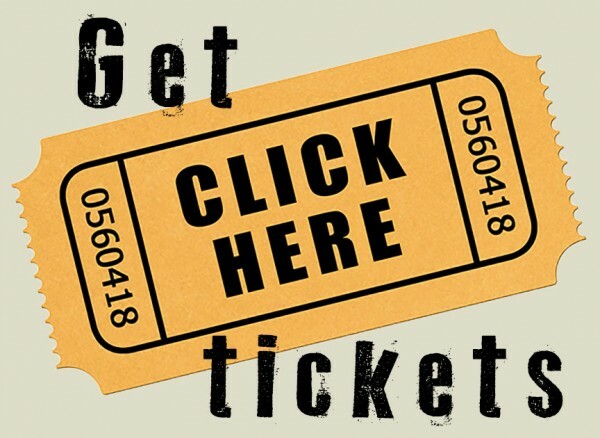 Click on the ticket! Discount advance tickets are also available at the lodge. Food & beverages (including alcohol) will be available from 11am until 1am. Vendors will be in the amphitheater area near the main stage as well as above the amphitheater at the lodge. Primitive camping (no electricity or water) will be available on-site for $10 per vehicle for the night of the event. Parking is $5 per vehicle. Seating will be a natural native prairie hillside. Blankets recommended. Alcoholic beverages and other food and drinks will be available for sale at the event. IDs required to purchase alcohol and must be 21 years of age. No outside food or beverages are allowed at the event premise. Guests in possession of outside food or beverages may be subject to removal from the event premise. Tickets are non-refundable. Refunds for cancellation due to inclement weather are subject to the discretion of Coteau des Prairies Lodge.